For more than 30 years, General Electric dumped more than a million pounds of dangerous toxic chemicals including polychlorinated biphenyls, or PCBs, into the Hudson River. 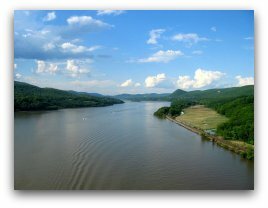 As a result, The Environmental Protection Agency declared a 200-mile stretch of the Hudson River a Federal Superfund Site- the largest such site in the nation. That toxic pollution decimated commercial fishing in the Hudson, and health advisories still recommend strict limits on eating fish from the river. Yet for decades GE has fought against cleaning up its PCB contamination. Finally last year the company undertook the first phase of a cleanup, roughly 10 percent of the job. In September, we asked you to urge the Environmental Protection Agency to ensure that General Electric commits now to finish cleaning up toxic PCBs from the Hudson River. More than 10,000 of you did just that, and it appears that the EPA will reject GE's request to delay its day of reckoning. However, right now another critical decision looms for the EPA, and the success of the cleanup hangs in the balance. On Monday, December 13th, the EPA is expected to announce the cleanup standards for the remainder of the project. We cannot lose this opportunity to finally clean up PCB contamination and help return a healthier and economically productive Hudson River to communities that live along its banks. GE hasn't been shy about telling the EPA what it wants to see: standards that protect the company's bottom line, at the expense of the Hudson and those who depend upon it. In the last several weeks, GE has offered to conduct the final phase of the cleanup -- but only if the EPA sets standards allowing the company to knowingly leave behind large amounts of PCB-contaminated sediment by capping over it, rather than safely removing this toxic material by dredging it. The original Record of Decision called for removal of PCBs, not capping. Please send a message urging EPA Administrator Lisa Jackson to ensure that GE commits to finish cleaning up its toxic PCBs from the Hudson River now. Subject: Don't back down from the EPA's commitment to a full cleanup of PCBs from the Hudson River! I strongly urge the EPA to hold General Electric accountable for a *full* cleanup of the toxic PCBs it dumped into the Hudson River for 30 years. The standards set by the EPA for the remainder of the cleanup must not give in to GE's thinly-veiled threats to walk away from the company's 2006 Consent Degree, if the cleanup standards are not to their liking. I urge the EPA to stick to the cleanup plan defined by its historic 2002 Record of Decision. The EPA must reaffirm that a genuine cleanup requires the removal of virtually all PCBs from the most contaminated portions of the river, except those excluded for specific structural reasons, or to protect archaeological or cultural resources. The EPA must not tolerate shortcuts that allow GE to leave behind huge amounts of toxic waste by capping over areas of PCBs that can and should be safely removed by dredging. Finally, no matter how GE responds, the EPA must hold the company fully accountable for cleaning up its toxic mess. The EPA is ultimately responsible for making sure GE fully cleans up its toxic mess. We cannot lose this opportunity to finally clean up the PCB contamination and help return a healthier and economically productive Hudson River to communities that live along its banks. Let's send the EPA a message that we want this done!